To summarize what we know to this point, the cellular process of transcription generates messenger RNA (mRNA), a mobile molecular copy of one or more genes with an alphabet of A, C, G, and uracil (U). Translation of the mRNA template converts nucleotide-based genetic information into a protein product. Protein sequences consist of 20 commonly occurring amino acids; therefore, it can be said that the protein alphabet consists of 20 letters. Each amino acid is defined by a three-nucleotide sequence called the triplet codon. The relationship between a nucleotide codon and its corresponding amino acid is called the genetic code. 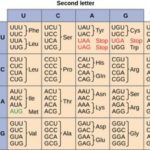 Given the different numbers of “letters” in the mRNA and protein “alphabets,” combinations of nucleotides corresponded to single amino acids. Using a three-nucleotide code means that there are a total of 64 (4 × 4 × 4) possible combinations; therefore, a given amino acid is encoded by more than one nucleotide triplet (Figure 8). Three of the 64 codons terminate protein synthesis and release the polypeptide from the translation machinery. These triplets are called stop codons. Another codon, AUG, also has a special function. In addition to specifying the amino acid methionine, it also serves as the start codon to initiate translation. The reading frame for translation is set by the AUG start codon near the 5′ end of the mRNA. The genetic code is universal. With a few exceptions, virtually all species use the same genetic code for protein synthesis, which is powerful evidence that all life on Earth shares a common origin.